Bellator lightweight champ Eddie Alvarez returns to action on April 2. UNCASVILLE, Conn. — Bellator lightweight champion Eddie Alvarez (21-2) will make his first title defense when he faces season two lightweight champion Pat Curran (12-3) at Bellator 39 at the Mohegan Sun in Uncasville, Conn. on Saturday, April 2 . The two were originally supposed to fight last season (season three) but Curran had to pull out of the match due to a shoulder injury and was replaced by Roger Huerta in a non-title bout. Alvarez has won his last six fights, all stoppages, and five by way of submission. His most recent bout was a second round TKO (doctor stoppage) of Roger Huerta in Oct. 2010 at Bellator 33. The 27-year-old Alvarez is 5-0 under the Bellator banner and is consistently ranked as one of the top-five lightweights in the world. Curran is riding a four-fight win streak. 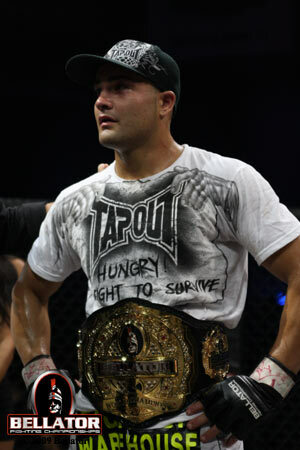 He made a clean sweep of Bellator’s second season, defeating Mike Ricci, Roger Huerta and Toby Imada, in that order. He was last in action at Bellator 21 in June 2010 when he defeated Imada via split decision in the season two tournament finals. In addition to the title fight between Alvarez and Curran, the event will also feature the Bellator debut of UFC veteran Ben “Killa B” Saunders (9-3-2), who will take on Strikeforce and Bellator veteran Matt Lee (13-9-1). Bellator 39 will also feature semifinal fights from Bellator’s season four welterweight tournament and a host of local feature fights. Bellator 39 will broadcast live on MTV2 with the first televised fight starting at 9 p.m. ET.